Join us for a special Fiddle & Banjo Workshop at the Tiki Parlour by two of today’s old-time masters. SOLD OUT! 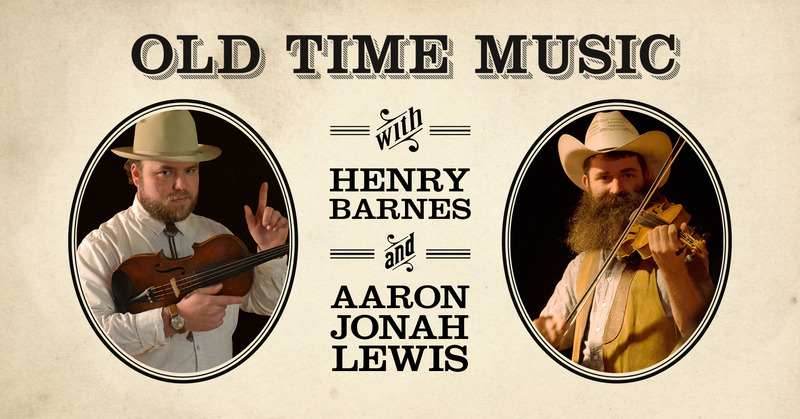 Henry Barnes and Aaron Jonah Lewis will be teaching a workshop focusing on the fiddle and banjo as a duet AND in the context of a band. Topics will include rhythm, swing, and their relationship to melody when playing as a group. They will also teach an intermediate/advanced tune with variations. Don’t forget recording devices! Henry Barnes is an Ohio native who has been playing the fiddle for 22 years. He has recorded with legendary old-time musician Dan Gellert. After starting with the Suzuki method, he was pushed by his father towards country music but he was captured by a love for Old-Time music after meeting West Virginia fiddler Bobby Taylor. Since then Henry has won contests in Ohio, Indiana, Kentucky, West Virginia, and Virginia. He recently won the Ed Haley Memorial Contest and the Elmer Rich Memorial Contest, placed 2nd in the Traditional Division at the Grand Masters Fiddle Championship, and placed in the top 5 at the Clifftop and Galax contests. Henry teaches lessons and workshops in central Ohio that are focused around personal connections and regional styles in Ohio, West Virginia and Kentucky. Aaron Jonah Lewis is a multi-instrumentalist, performer and educator. He has won awards at the Clifftop Appalachian String Band Festival, including First Place Neotraditional Band in 2008 and 2015, and at the Galax Old Fiddlers Convention, including First Place Bluegrass Fiddle in 2007, and he has performed at major festivals from the US to the UK and from Italy to Finland. Lewis has taught workshops at the the Royal Scottish Academy of Music and Drama in Glasgow and at the English Folk Dance and Song Society in London. He also plays and teaches banjo, mandolin, guitar, and bass and is currently based in Detroit.